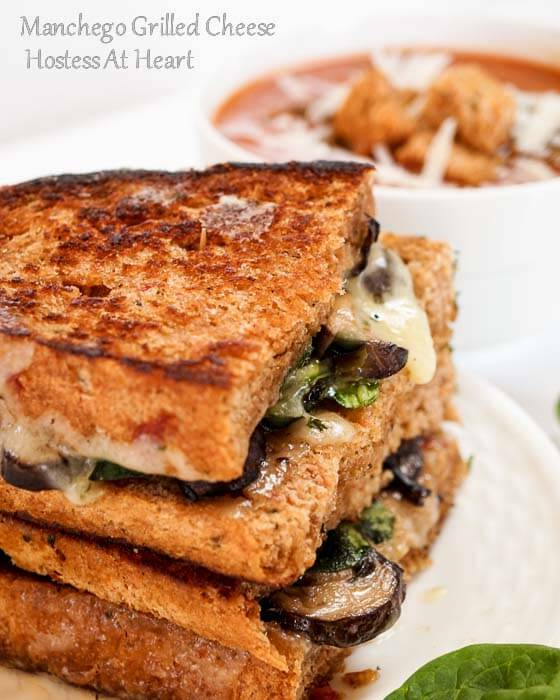 Every single layer of this grown up grilled cheese makes it one fabulous sandwich. 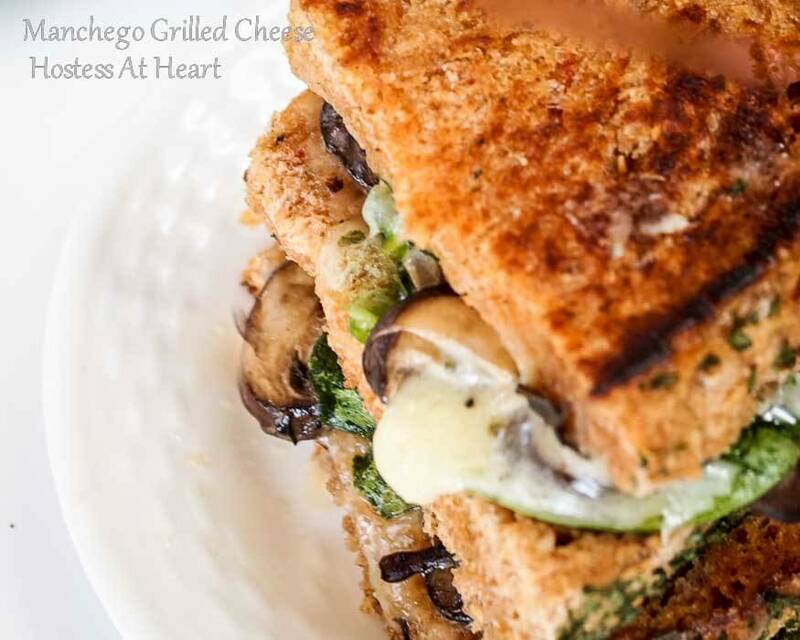 Manchego Grilled Cheese will soon be your favorite grilled cheese. I heard that there was an actual “Grilled Cheese” day and that this was grilled cheese month. Who comes up with this stuff, and why wasn’t I notified earlier? I got to work on my favorite grilled cheese. Do you have a favorite? I grew up going to religion classes on Saturday mornings. I thought that was the biggest rip off because Saturday morning was when the best cartoons were on television. Not only that, the classes were so boring. All I knew is that I had to memorize a whole lot of stuff and if I didn’t, I could end up in a very warm place at the end of my days. Yikes! When our classes were over, we went home to a lunch of grilled cheese and tomato soup. Tomato soup was from a can, and our grilled cheese was a skinny yellow piece of cheese on buttered white bread. I loved it. Of course, I loved anything drowned in ketchup. The grilled cheese that I make now has grown up a bit. My little person self would probably turn up my nose. My big girl self just loves every single layer that makes them fabulous. They start with great bread slathered with a bit of butter on the outside and a smear of fig chutney or jam on the inside. 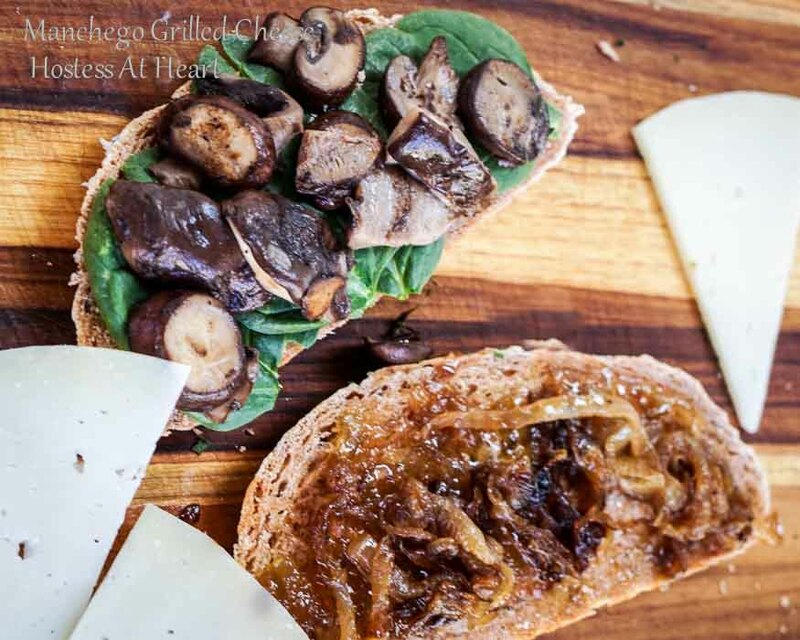 This yummy bread holds together caramelized onion, mushrooms, fresh spinach and Manchego cheese. Manchego is a smooth, nutty cheese that can stand up on its own. Then everything is melted together. The result is an amazing sandwich that is just delicious. So, I may not have been great at memorizing my religion, but I aced grilled cheese! And, the tomato soup was there too, a bumped up big person version called Easy Tomato Florentine Soup! In a heavy skillet, melt 1 tablespoon of butter. Add sliced onions and season with salt and pepper. Cook on medium low heat until browned and caramelized. Remove from the pan and set aside. In the same pan as you used for the onions, add the mushrooms. Stir continuously and when they begin to soften, add sherry and thyme. Continue cooking until sherry has evaporated and mushrooms are soft. Remove from the pan and set aside. Butter one side of each slice of bread. On the non-buttered side, spread a thin layer of fig jam or chutney. Layer 1/4 each of the mushrooms, fresh spinach, Manchego cheese, and caramelized onion. Top with the second piece of bread, buttered side out. Place the sandwich butter side down in the heated skillet and top with another heavy skillet, pressing gently to flatten. 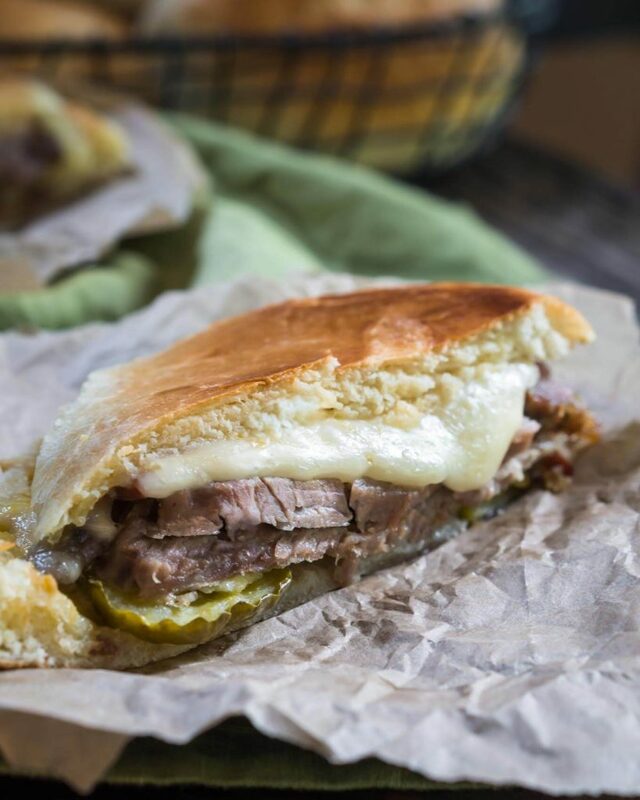 Cook sandwich 2 minutes on each side or until the bread is browned and the cheese is melted. 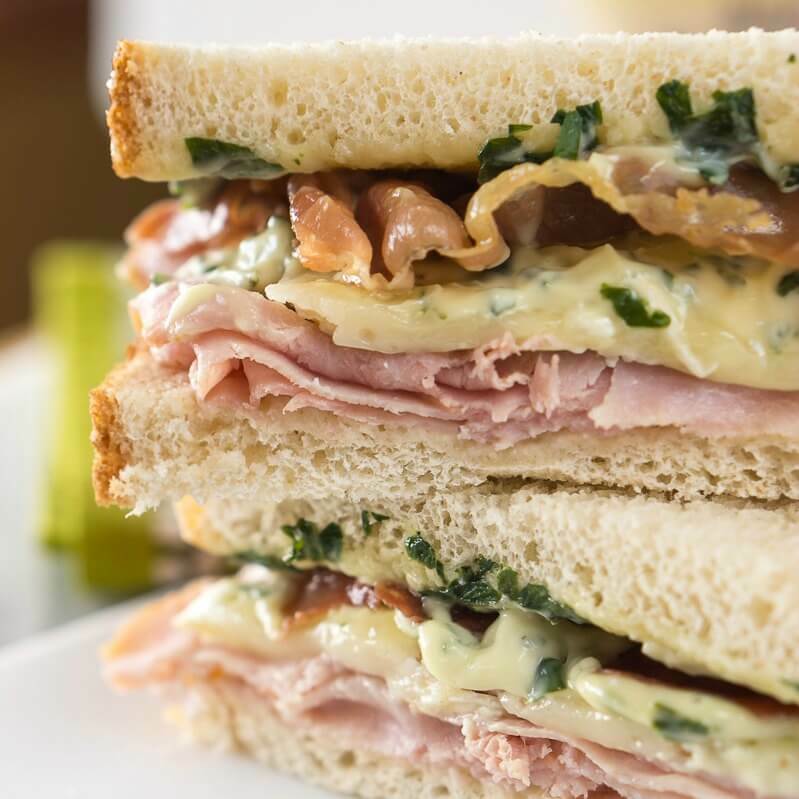 Here are a couple other amazing sandwiches recipes! How good is manchego cheese??? And mushrooms and thyme are beautiful flavours, I love your toastie! Thanks for sharing with FF#65. I think I should try this machengo cheese, it’s something new to me… and looking at your sandwich I bet it must be delicious! Oh Julie this has got to be the world’s greatest geilled cheese! Love Manchego and everything else in here. I heard it was National jelly bean day but passed on trying a blog post using them somehow missed it was geilled cheese day! I could sink my teeth in that! The tomato florentine soup was the perfect accompaniement! YUM! Thank you Johanne! I’d pass on the jelly beans too. I guess we can just cook and call any day what ever we want. That roast lamb of yours could be a national day all by itself! Funny, I had no clue that there was a day set aside for grilled cheese? What will they think of next eh? What a wonderful combination grilled cheese though, love that melted cheese oozing out. Also, did you use any of the bread you had made recently? Congrats on the shout out for last week, and deservedly so. You have become quite the Queen of Breads :). Enjoy your weekend Julie. 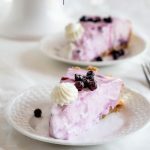 I wanted to email you and thank you for featuring my recipe in FF! That was wonderful! I actually make french toast with the egg twist and it was yum! I bought a loaf of tomato herb from my favorite bakery for the grilled cheese. Someone just said that there was a National jelly bean day. I say so what to that one! Thank you for co-hosting my friend. I don’t know how you do it all! I do love manchego, and the rest of your filling sounds great as well. Yum! Thank you Caroline! It was pretty darned good. Love, love, love this. I could eat grilled cheese sandwiches every day of the week. This one looks amazing! Natalie, did you change your blog? It wont let me bring it up? Julie, thanks for the heads up. I haven’t changed my site, so I’m not sure what’s going on. It seems to work if you go through the gravatar profile, there’s just no link through my name? I’m not very tech savvy, but I’m looking into it, lol. I just got your following email and was able to click to your site through your gravatar but it still doesn’t work from here. Techie stuff drives me nuts! Thank you Natalie! They are so good. Another friend made them an put in some jalapenos! That sounds good too! OMG! All I can say is I’m obsessed with this! I need this in my life ASAP! These look INSANELY good Julie!! Your pics are REALLY good, I find it hard to take good grilled cheese pictures- is it just me? Some things are just harder than others. I loveeeeee mixing up different ways to make grilled cheese and this really looks and sounds SO good, pinning! Thank you! I am really working on my photography, and there is so much advice out there that I am just trying to learn what works for me. It is hard taking pictures of melty cheese because it likes to get cold and homely! Homely or not it is delicious! Me toooo Julie…. me toooo.. I’ve been reading all kinds of resources, man, there is always way more that goes into it than meets the eye, right? Well I can definitely see a difference in your photos lately (though they’ve always been good)- so whatever you’re doing is working! Thank you! I don’t see a thing wrong with yours! Thank you Judi. I like the Manchego. Sometimes some cheese just overpower the other ingredients or melt so quickly that it turns to liquid. Manchego doesn’t. This is so my brunch for tomorrow Julie! Love it!! Thank you! It makes enough for a couple meals. I hope you enjoy it Sonal! I made a version today Julie with baby porrabella, onions, garlic, jalapeños and cheddar. That sounds amazing Sonal! 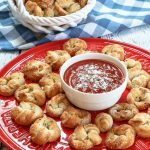 My hubby and I would love the jalapenos addition which goes perfectly with cheddar! Oh gotta love the Manchego!!! I think YOU just made my new favourite grilled cheese. Thank you Chitra! It was indeed yummy! Yummy! 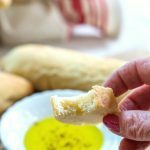 Delicious with olive bread too! Thank you! Good bread is a must! Wow that is an amazing sandwich. It’s making me want one for my lunch! Thanks Dave! We enjoyed them for dinner and then the next day for lunch too! Thank you Dani! It is so yummy and one that I will make again. My favorite cheese, my that sandwich looks good. Nothing like a buttery crisp on the outside melty gooey cheese on the inside. Then you add the mushroom and onion Wow!!! Oh I wish you could see me drooling over my keyboard! Yum! Thank you Lucy! I am so glad you visited! It gave me the opportunity to head over to your amazing blog and pinterest and twitter…. Very nice 🙂 we call them toasted cheese sandwiches, or toasties..I never used to know what ‘grilled cheese’ sandwiches were!! I haven’t had a grilled cheese in months! And I’ve never had a grown up grill cheese like this before. I love fig chutney and what a brilliant idea to use it in a grilled cheese. I am keeping this recipe for sure. Thank you so much! It is definitely a regular for us. Wow! The sandwich looks so delectable Julie!! Never heard of Manchego cheese, will try to see if I can get some . Thank you! My man hero was a Spanish cheese. It’s mild but flavorful at the same time. I’ve always wanted to try Manchego cheese and still haven’t. This sammitch gives me a driving reason!! Looks wonderful. Thanks Debbie. It’s a great cheese for cheese trays or grilling! Oh Julie! This looks incredible! So many flavors going on. I would absolutely love this! Thanks for sharing the recipe. It’s amazing how our tastes change as we grow up too! 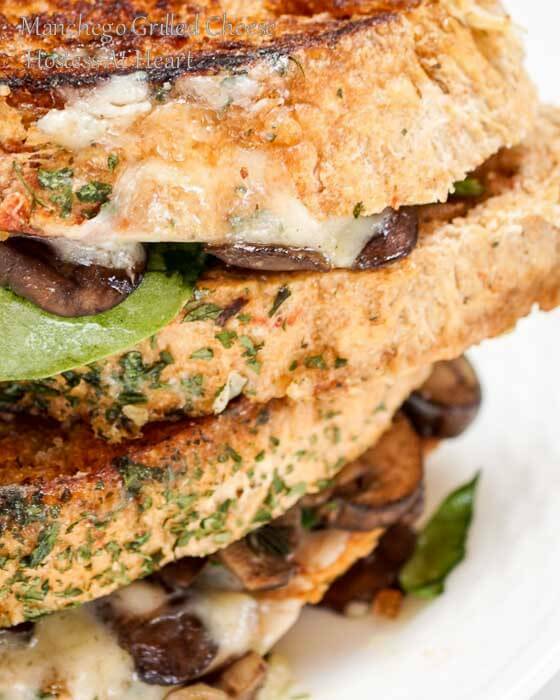 I used to be happy with just cheese and Green chilli grilled cheese, but now I LOVE the extra additions! Thanks Dini! Dini I would love a green chilli cheese! That just sounds amazing! If I even hear of using fig when I was a kid I would have really given the yuck face. Manchego is so GOOD! I bet this sandwich is fabulous!! Thank you Jamie! 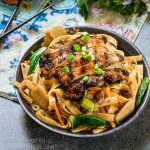 Easy and yummy my favorite ingredients! Interesting that there is a month for grilled cheese. I do like them though and the bread choice always makes the sandwich more special. You are right! I used a bakery loaf of tomato herb. Very yummy! This might come as a surprise to you but I’ve never had melted Manchego! It’s so fabulous on its own, especially the aged varieties, and the one containing rosemary, that I’ve only had it on its own. 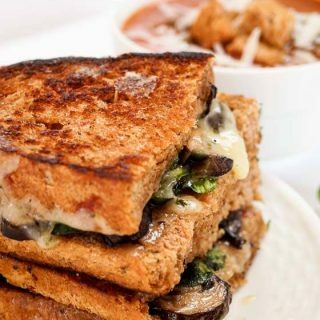 But this grown up grilled cheese looks wonderful!!! Julie this looks so fabulous–that fig jam! Consider me converted! It’s funny, but those kid meals are so comforting now! We have been making grilled cheese sandwiches with tomato soup for a quick dinner and it is so satisfying on a soul level! I dare say, even more than religion class (you totally got hosed on Saturday mornings)! Oh, and I learned a little trick from Bon Appetit and instead of butter, I use mayonnaise on the outside of the bread. So good! Great idea! I know on the cartoons right? Thank you Amy! It was a new try for me and I am glad that I did. It was thick and creamy without turning to liquid. Plus it’s not so strong that you can’t taste everything else.